The Kildare County 'B' Championships will take place in Newbridge on Sunday next 28th of June at 12.00. Athletes should be there at 11 to facilitate warm-up and registration. All competing athletes must wear club singlet and navy shorts (We have singlets in stock if you need one). The 'B' Championships are open to any athlete who did not win a medal in the track events in the Kildare County Championships can compete in the track events and any athlete who did not win a county medal in the field events can compete in the field events. The recently updated version of the AAI issued National Juvenile Booklet is available to download by clicking here. The Leinster Championships took place over the weekend, six Le Chéile atheltes took part in events over the two days. Julie Boyle and Erica Dixon were down on day one, Julie competed in the 80m hurdles and 200m sprints. Julie got off to a flying start and was 2nd in the 80m hurdles, we are just waiting on confirmation on the time but hopefully it will be a new pb. Julie was 4th in her 200m heat, just missing out on a place in the final. The girls u17 inter County relay was one of the last events of the day, Julie was on the County team, they ran a stomer, Julie paid tribute to Sinead Lawlor of Celbridge AC who ran the last leg of the relay and took the team home to gold - Leinster County Champions , this young u17 team will go forward to the All-Ireland relays, please note that Julie is curently an U16 athlete. Congratulations Julie on your success and best of luck in the All-Irelands. Erica Dixon competed in the 3000m on day one, unfortunately Erica in 3rd position suffered an asthma attack and had to withdaw after 5.5 laps. An early start to day two saw Sean Kelly and Fiachra Mac Suibhne u14 compete in the Shot putt event. There were 13 athletes listed, Sean threw a best of 6.78m in his first Leinster Competition 8th overall, Congratulations Sean. Fiachra in a best throw of 7.11 made it into the final 8 - however the final shot putt had to wait as Fiachra was called to his 800m - straight final. This 800m U14 is a tough event no longer middle distance but a sprint. Fiachra was to the rear of the pack in a very fast 1st 400m 62sec - however he put the boot down when I gave him a shout with 250m to go and overtook 5 athletes to finish in a very respectable 8th position overall. Fiachra returned to his shot putt final, Fiachra proceeded to have 3 further throws with a best of 7.55m with left him 5th over all - Congratulations Fiachra on your first Leinster competition, unfortunately the first 4 go through to the All-Irelands. Conor Murphy -U16 athlete was next to take to the track, Conor has been out injured for the last 3 months and despite his coaches advice was determined to run in the 800m as apposed to the 1500m favoured by his coach. Conor as usual was very relaxed prior to his event, he set off well and was in the middle of the pack, the first athlete went through 400m in 58 sec so a fast race - Conor was not put off and tried his best to keep in touch with the lead athlete, Conor finished in 6th position in a very respectable time of 2.23, which equalled his Nenagh indoor performance. Erica Dixon had a early start on day two of the competition, having put day one behind her, Erica proceeded t0 throw a PB 30.08 in the u18 Javelin competition, Erica will make the top 20 Irish List of all competing athletes at Junior, Senior and International level (see AAI top 20 list). Congratulations on your success and best of luck in the All-Irelands. For a complete set of results from the event - click here. Due to an increasing number of requests from interested runners, we have decided to host a weekly Meet & Train session. This session is designed to offer participants the opportunity to put some structure on their training and to offer coaching to help achieve running or fitness goals. Whether you are a complete beginner, or a regular runner who is looking for a group of people to train with, these sessions will be of benefit. The first session will take place on Wednesday 24th of June at 20:00hrs on the Le Chéile AC running track behind the Leixlip Amenities Centre. All that is required is an interest in running, a pair of runners and a drink! Come along and meet others who share your interest in running. Two Le Chéile athletes competed as part of the Kildare Team in the National League. This is a team event and Kildare are in division 1. Athletes from Kildare Town, Celbridge AC, St Cocas AC, Newbridge AC and Le Chéile AC battled against 5 other teams in their division. With wins in the 100m Sinead Lawlor, Niamh Fields 200m, 2nd in the Javelin Erica Dixon(Le Chéile), Niamh Field 100m, Fiona Hill L.jump, Rachel Smyth 800m, 3rd Fiona Hill 400m, girls 4 x100 relay. 4th High Jump Aine O'Connor(Le Chéile) new PB 1.45, Niamh O'Brien 1500m girls 4 x400m relay. Elaine Beirne ran two great legs in the 4x100m and 4 x400m relay and Pauline Kelly competed in s.putt and discus. This Kildare team is a very young team and they fought hard for their points, the support that they gave to each other was fantastic and they were very happy with their performances. I was delighted to be asked to be team manager and they made my job very easy, so thank you to all the girls I hope you all had a well deserved lie in today. Kildare Team -89points. Congratlations and best wishes for round two which will take place in Tullamore on 5th July. 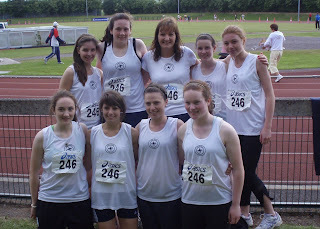 Six Le Chéile athletes competed in the Leinster Championships held on Sat 13th June. Being the Leinsters it was a tough event, but Catehrine Jones, Niamh Kane (u12) Conal Hayes, Patrick Flanagan (u12) Conor Kiely and Sean Flanagan (u13) were up for the Challenge. Niamh Kane and Sean Flanagan came away Leinster Champions! Niamh, who was competing in her first Leinster Championships, won her u12 60m sprint in a time of 8.92. She also competed in the long jump. Seán came 1st in the u13 long jump with a best jump of 4.38metres, 2nd in the 80m and 4th in the 600m. Both athletes have qualified for the All-Ireland Championships in July. Conal Hayes came 4th in the u12 600m final just missing out in the medals; Catherine Jones competed 60m,600m and in the u12 long jump along side Niamh. Conor Kiely was our second competitor in the u13 boy’s long jump, he also competed in the high jump and 80m. Patrick Flanagan just missed out on a place in the U12 60m final, he also competed in 600m. Well done to everyone in what was a very long day for the parents and athletes; A hugh thanks to Anne Kiely who looked after the athletes on the day and provided this report. Click here for a full list of the competitions results. Please note that warm-up and registration will take place from 6:30 at the Celbridge AC track. Entry is €2 payable on the night. If you dont have a club vest please wear a plain white t-shirt. Erica Dixon competed in the All Ireland Schools which were held on 30/05/09 in Tullamore. Erica was competing in the Inter girls Javelin, Erica's best throw was 29m.50 which saw her ranked 5th overall,. Erica was delighted with this as it is a new PB, congratulations and well done. It was a fantastic day of athletics which saw a number of records broken on track and saw a couple of athletes achieve their junior international times.